Kendrick Chittock hails from Northeast Ohio. 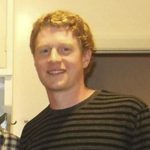 He is now studying Resource Management at New Zealand’s Lincoln University. Paddling in New Zealand seems to culminate on the coast, The West Coast. The Coast is where the waves break against the base of the mountains and each individual river system has its own small catchment in its own river valley. It can be thundering rain in one place with flooding brown rivers, yet one valley over may not have had enough precipitation to fill its own streams enough to float a boat. 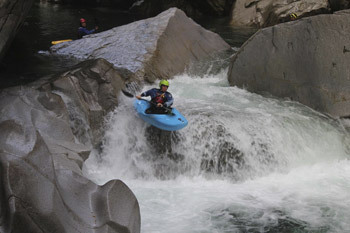 With huge boulders, high gradient, and deep green rainforests, The Coast is an international paddling destination. How lucky I am to have it within three hours of Lincoln University! The Coast is not the place for beginners, although it does offer some easier water at times. It is best appreciated when a kayaker is breaking out of Grade 3 and into Grade 4 and of course, all the skill levels above and beyond where weekend warriors seldom roam. After convincing some other paddlers (instantly) to join in, we left after school and work on a Friday and woke up early the next morning to paddle. Our group was great; they just failed to mention we would be tackling the most difficult river on our list the first day of the trip. What a way to start. 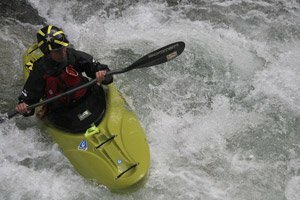 Sometimes, too much time before a rapid or river allows me to talk myself out of it, or convince myself I can do it. On the walk-in to the Styx, I probably reached both conclusions more times than I could count. The walk itself is an adventure, and hauling kayaks up a tramping track for over an hour is no easy task. We carried the boats on both shoulders, dragged them behind us with slings, and even tried to rig a backpack style carry system. Whichever way we chose to carry them, it did leave us sufficiently warmed up! A few of us put in and allowed the better paddlers to go ahead so we could follow their lines and know when to scout, and fortunately, they did not lead us astray. There are so many hazards and risks associated with this type of paddling; impacts against rocks, sticky re-circulating holes, getting pinned the wrong way and even cold water. it is sometimes difficult to focus on what needs to be done instead of what shouldn’t be done. As it is crucial, however, the only choice is to line up the boat, have confidence in yourself and paddling group, and shred it. It doesn’t mean you won’t get wet or that you’ll make it look good, but that there is a long range in between the two outcomes. I take satisfaction out of any day on the water, but paddling at my peak through boulder gardens and rainforests that I would have otherwise never seen makes for a memorable day in a world-class location. 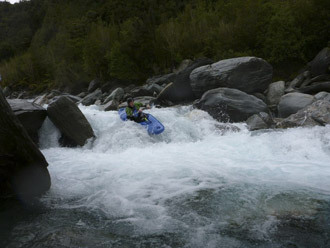 The next two days, although providing similar difficulty on different rivers, were as enjoyable as the first. As little of a piece of The Coast as I was able to do in a long weekend, it did leave me with an understanding of why so many people journey here to this steep, wet, green, and epic outdoor location. It also left even more to paddle, more to hike, and more to explore. Whatever it is you do outside, keep walking up stream a little further each time you go.